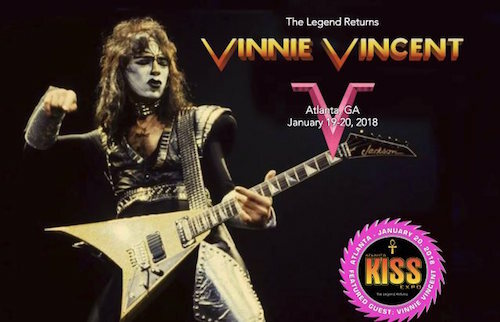 Former KISS guitarist Vinnie Vincent is featured in a new promotional video for his upcoming appearance as a special guest at the Atlanta Kiss Expo next year, watch it below. To read more about this event, please click here. Additionally, the Atlanta KISS Expo has an FAQ section, which addresses Vincent’s appearance. Vincent replaced lead guitarist Ace Frehley in 1982 and played with KISS for two years. What “saved” KISS in 1983 was taking the makeup off. At best, Vinnie Vincent “helped” KISS. If he “saved” KISS, why hasn’t he been able to save his own career? This promo is not very promising. If Vinnie thinks that the worldwide interest in his return to the public eye is to remind us that he “saved” Kiss, he’s just deluded. (“Lick It Up” is one of my top three Kiss albums). He may be surprised to find more than a few bill collectors in Atlanta, people he stiffed back in the 90s in the promise that he would deliver on an album. kiss-speak: the longer you’ve been a member of kiss, the more important you are.